What a fantastic night! 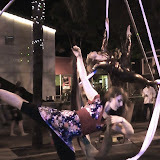 We set up the aerial rig right in the middle of the festival and did aerial performances throughout the night as well as ground acts - stilt walkers, jugglers, whip crackers and belly dancers all made an appearance. It was so much fun to perform for this crowd! The SubZero festival is an art festival, and there were artists of all types and art-appreciators of all types too. It was not a crowd that was steeped in Circus arts, so what we were doing was really new to a lot of people and the audiences were so enthusiastic and fun, and so appreciative. We got a lot of interest in the Circus Collective. Also, this was my first outdoor tissu performance - the rig is fairly new and while I've had the chance to practice on it, this was the first opportunity I've had to actually perform. Performing outside sure is different! The wind blows the tissu around a bit, and the view from the top is especially distracting.. I would climb up, drop into a pose and just smile as I gazed out at the sea of people extending down the street in both directions. We got some great video which is STILL rendering (yay for new high-res video cameras, but boo for lack of appropriate processing power).. for now, here are a few stills.. enjoy!